On Wednesday, July 22, 2009, a solar eclipse will be visible in the equatorial regions spanning both hemispheres. A total eclipse will occur within a narrow corridor in eastern Asia and the Pacific Ocean. It will be visible first on the northwestern coast of India at sunrise (just before 01:00 UT) and continue through Nepal, Bangladesh, and Bhutan, crossing into China, where it will be visible in several large cities, including Shanghai. The moon's shadow will then cross into the East China Sea, across Japan’s Ryukyu Islands, and on to Iwo Jima at 02:27 UT, the Marshall Islands, and the Gilbert Islands, ending in the southern Pacific Ocean at 04:18 UT. Maximum eclipse will occur in the Pacific Ocean at 02:35 UT, lasting 6 minutes and 39 seconds. To see a detailed description of the eclipse path, please visit NASA's Eclipse page. For useful information about eclipse photography, please visit Fred Espenak's Eclipse web site. 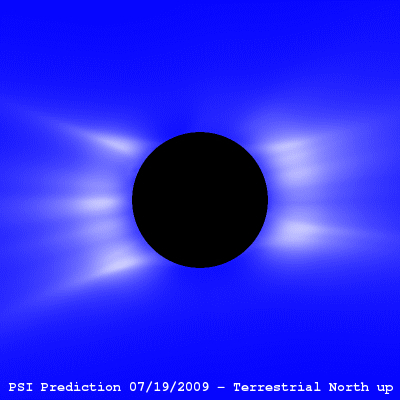 On July 9, 2009, we started an MHD computation of the solar corona, in preparation for our prediction of what the solar corona would look like during this eclipse. We used photospheric magnetic field data for Carrington rotation 2084, measured up to June 26, 2009 by the MDI magnetograph aboard the SOHO spacecraft. We typically also use magnetic field measurements from the Wilcox Solar Observatory at Stanford and the National Solar Observatory SOLIS vector magnetograph at Kitt Peak. A very useful prediction of the photospheric solar magnetic field is carried out by Karel Schrijver and Marc DeRosa at Lockheed Martin. A preliminary prediction of the state of the solar corona during the eclipse based on this data was posted on this web site on July 13, 2009. This preliminary prediction can be found here. On July 15, 2009 we started a new calculation with updated magnetic field data that was measured with MDI up to July 11, 2009. This page now has the updated (and final) prediction, and was posted on July 19, 2009. Our prediction is based on a magnetohydrodynamic model of the solar corona with improved energy transport. We used this model for the first time to predict the structure of the corona prior to the March 29, 2006 total solar eclipse. The improved energy equation model includes the effects of coronal heating, the conduction of heat parallel to the magnetic field lines, radiative losses, and the effect of Alfvén waves. This produces a significantly better estimate of the plasma temperature and density in the corona. For technical details about our improved model, please see the publications below. The prediction shown here uses our new model, and allows us to predict emission in extreme ultraviolet (EUV) wavelengths and X-rays, which can be compared with solar observations from the EIT imager on SOHO and the X-ray instrument on Hinode, in addition to emission in polarized white light (polarization brightness, pB) that is typically measured during an eclipse. Some technical details about the calculation that was used to make our final prediction can be found here. For your curiosity, you can see the milestones in achieving our prediction here. The figure on the left shows the predicted polarization brightness (pB) in the solar corona for the eclipse expected on July 22, 2009 at 02:35 UT (corresponding to the moment of greatest eclipse in the Pacific Ocean). The state of the solar corona was computed using a 3D magnetohydrodynamic (MHD) simulation. The pB signal is produced by white light scattered off electrons in the coronal plasma. The image has been radially detrended using the Newkirk vignetting function to account for the fall-off of coronal brightness with distance from the Sun. Vertical (top) is terrestrial (geocentric) north. This is the view of the Sun that would be seen by an observer on Earth with a camera aligned so that vertical is toward the Earth's north pole. 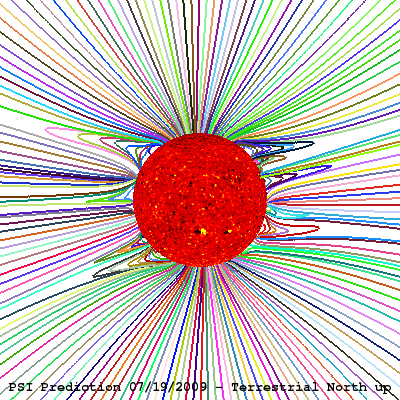 To view this image in a coordinate system aligned with solar north, click here. Click the image to see it in greater detail. 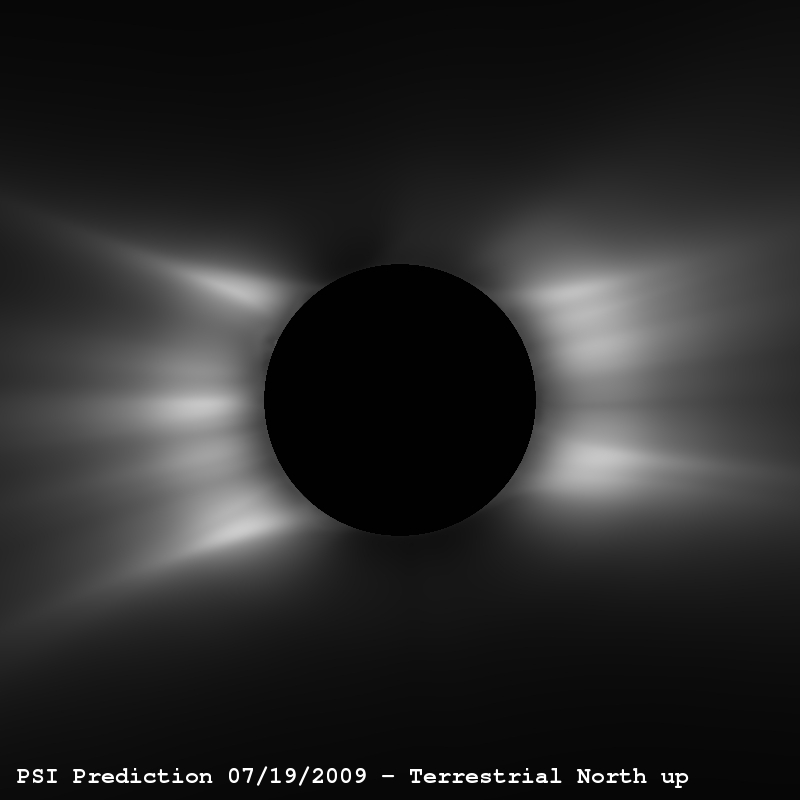 Predicted polarization brightness (top left) together with traces of the magnetic field lines in the solar corona (top right) for the eclipse expected on July 22, 2009 at 02:35 UT (with terrestrial north up). 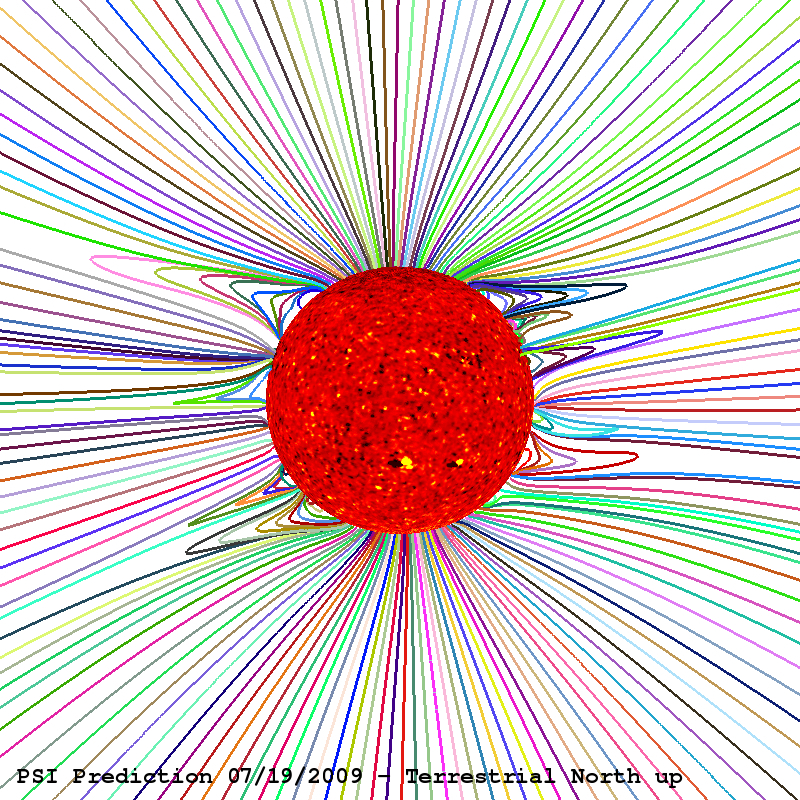 The Sun's surface shows color contours of the radial component of the measured photospheric magnetic field from the MDI magnetograph, showing the location of active regions (strong magnetic fields). Click the images for higher resolution pictures. To view these images in a coordinate system aligned with solar north, click here. The photospheric magnetic field maps we use for our calculations are built up from daily observations of the Sun during a solar rotation. These maps give a good approximation of the Sun's magnetic flux if the large-scale flux does not change much throughout a rotation. Previously, we have computed coronal models for an eclipse during the declining phase of the last solar cycle (November 3, 1994), for three eclipses during solar minimum (October 24, 1995, March 29, 2006, and March 9, 1997), one eclipse during the the early rising phase of solar cycle 23 (February 26, 1998), one eclipse approaching solar maximum (August 11, 1999), and two eclipses near solar maximum (June 21, 2001 and December 4, 2002). The July 22, 2009 eclipse occurs near solar minimum, so the solar corona ought to (and does) have a simpler structure than at solar maximum. It can be seen that the solar corona is most similar to that seen in last August's eclipse, and eclipses near solar minimum on November 3, 1994, October 24, 1995, March 29, 2006, and March 9, 1997. These figures show the evolution of the radial component (Br) of the solar photospheric magnetic field for three Carrington rotations preceding the eclipse, as measured by the MDI magnetograph aboard the SOHO spacecraft. We use smoothed versions of these magnetic field maps in our calculations. We used the data for Carrington rotation (CR) 2084 in our calculation for our preliminary eclipse prediction, which was posted on July 13, 2009, and can be found here. The last panel shows the magnetic field data that was used for the final eclipse prediction, which is posted on this page. That calculation was started on July 15, 2009, and was posted on July 19, 2009. Our 3D MHD model with improved energy transport allows us to simulate the emission from the corona in extreme ultraviolet and X-ray wavelengths. The Sun can be observed in these wavelengths from space. In particular, the SOHO/EIT, TRACE, and STEREO/EUVI, and Hinode/EIS telescopes routinely take EUV images of the solar corona, and the Yohkoh/SXT (no longer operating) and Hinode/XRT telescopes image the soft X-ray Sun. Our simulated coronal emission is available here. We have made movies of the polarization brightness (pB) from our MHD simulation. This illustrates visually how the solar corona changes as a result of solar rotation. You can see a grayscale movie of pB with a black disk occulting the Sun: a GIF version (4.4 Mbytes, recommended), a QuickTime version (2 Mbytes), or a half-resolution GIF version (1.6 Mbytes). You can also see a movie of pB with a blue background and a black disk occulting the Sun: a QuickTime version (364 kbytes, recommended), or a GIF version (4.4 Mbytes). We have made a movie of the magnetic field lines and simulated emission from the Hinode XRT telescope (Al mesh filter). This is a simulated "synoptic" XRT image wrapped on the sphere, so emission on the limbs is not visible. Blue field lines are closed, green field lines are open. This movie illustrates the relationship of closed and open structures to features in emission. NASA's Eclipse web site (A great resource for the eclipse, including lots of information). Our work is supported by NASA, AFOSR and NSF through the Strategic Capabilities program, by NASA's Heliophysics Theory Program (HTP), by the Center for Integrated Space Weather Modeling (an NSF Science & Technology Center), by NASA's Supporting Research & Technology (SR&T) Program, and by NASA's Living With a Star (LWS) Program. We thank the staff at the Texas Advanced Computing Center (TACC) for graciously providing us with dedicated time on their massively parallel supercomputer Ranger, and NASA's Advanced Supercomputing Division (NAS) for an allocation on the Pleiades supercomputer. Our calculations for the eclipse prediction were performed on these computers. We thank Todd Hoeksema of the Solar Physics Group at Stanford University for providing us with timely access to MDI magnetograph data and for sharing the latest calibrated data with us.